Our Success. It's All In The Logo. Several years ago, Authentic NATURE STONE® Brand Flooring adopted the term “YaYa” and incorporated it into its logo. If you look closely you will see it under the “e” in the word Stone. Since then we have been asked by those perceptive enough to notice – and curious enough to ask – what “YaYa” meant. Many have speculated that it might be some kind of code or related to the movies, e.g., “The Sisterhood of the YaYa” or “Sandlot” in which one of the kids was named YaYa. I am told that in Greek, yaya is an affectionate term for grandmother. In light of the question and speculation, I thought it might be time to tell the story. YaYa is the enduring nickname of a real person who was born and raised in a small, close knit community on the east side of Cleveland, Ohio. As the story goes, a young sister couldn’t pronounce his name and called him YaYa. His family affectionately copied her and the name stuck. As a young boy, he excelled at sports, but especially at baseball. 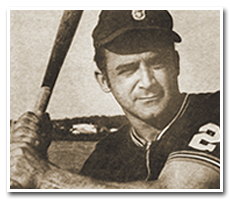 As a young man he had a one-in–a-million opportunity to play professional baseball. He was invited to spring training by the Philadelphia Athletics, but as fate would have it, broke his arm just before spring training camp was to begin. However, YaYa was not deterred. His love of the game, his hard work and his commitment to excellence propelled him to a career as one of Cleveland’s premier sports figures. YaYa became an “All World Player” who starred in 16 world softball championships. He had been called “The Star Among Stars” and “Probably the Greatest Slo-Pitch Softball Player in Cleveland History.” A Cleveland newspaper referred to him as a local legend and many agreed. YaYa was named to the Greater Cleveland Slo-Pitch Hall of Fame in its inaugural class of 1985 and to the Greater Cleveland Sports Hall of Fame in 1990. That was the public side of YaYa. Privately, he was a family man with a heart as big as the city he came from. His love and support for his family were beyond limits. He toiled as a cement finisher and, like his baseball career, he gave it his all. His work ethic, commitment to excellence and many friends, YaYa went on to become a successful cement contractor. As in any small business, there were always ups and downs. But as YaYa had done many times in the game of softball and life…he would simply get back up, dust himself off, move forward and become better for it. YaYa was also a generous man to all who knew him and believed in giving. YaYa offered a helping hand to anyone who asked. Whether it was a small favor, a job, or some financial support, he never refused and always found a way to help. YaYa played through numerous knee, arm and ankle injuries –which he overcame by his knowledge and instincts about batters and where they would hit. “He could field, throw, run, hit, hit for power – everything,” says Buddy Langdon, director of the Greater Cleveland Slo-Pitch Softball Museum and Hall of Fame. I was extremely fortunate to know him. He was the one who taught me the cement finishing trade. He helped me out more times than I can remember. When I was down and struggling, at the lowest time of my life, he gave me a job and pointed me in the right direction. And when I had nothing more than a trowel and an idea, he encouraged me and helped me to start the business that evolved into Authentic NATURE STONE® Brand Flooring. He was and continues to be the inspiration for me and for Authentic NATURE STONE® Brand Flooring. As Authentic NATURE STONE® Brand Flooring celebrates more than 27 years in business and having served more than 50,000 customers, I am humbled that the name NATURE STONE has become synonymous with stone and epoxy flooring and proud that it stands for quality and integrity. Many people perceive Authentic NATURE STONE® Brand Flooring as a large national corporation and are not aware that we are actually a family-run business that was started and remains deeply rooted in Cleveland, Ohio. It was YaYa who instilled in us his work ethic and commitment to excellence. It is by the standards and the examples he set throughout his life, that we continue to overcome our own ups and downs and strive to be the best. Like YaYa, we are proud to be not just from Cleveland but of Cleveland. YaYa passed away September 30, 2004. I was there at his side with his family all around him and I remember thinking that this is a great man. The day of his funeral, his friends and family gathered together in a tribute of deep respect and love for him. I hoped people would remember him after his death as they did in his life – as the Best of the Best. I am glad he had the chance to see my accomplishments and the growth of Authentic NATURE STONE® Brand Flooring. I think he knew that he played a major role in it. I know he was proud. A business logo is a symbol that acts as an identification of the company it represents. YaYa had a tremendous influence on me and was always an inspiration. That’s why, shortly after his passing, I incorporated his name into the Authentic NATURE STONE® Brand Flooring logo as a symbol of how I will always strive to be like him. He will always be an important part of my life and of Authentic NATURE STONE® Brand Flooring. That is how I continue to honor my father….Andrew “YaYa” Masetta.